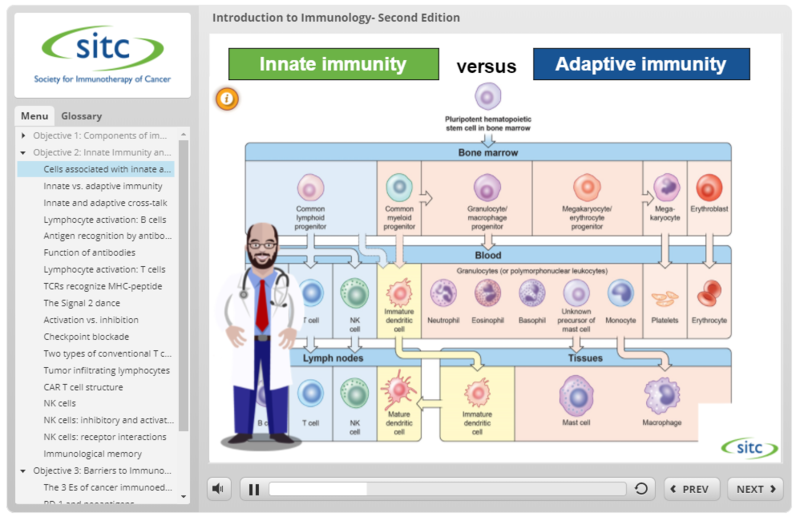 This interactive course provides an overview of the immune system, focusing on the mechanisms by which the immune system eliminates foreign pathogens and cancer cells. The foundational knowledge presented in this course is critical to understanding how the immune system can be harnessed to treat cancer through immunotherapy. This activity is intended for physicians, pharmacists, registered nurses and other healthcare professionals engaged in the care of patients with cancer. Describe the function of the components of the immune system, including relevant cells, molecules and organs of the immune system. Differentiate between the adaptive immune system and the innate immune system. Recognize the barriers to effective immunotherapy, including mechanisms by which tumors locally disable and/or evade the immune system. A qualified healthcare professional should be consulted before using any therapeutic product discussed. Readers should verify all information and data before treating patients or employing any therapies described in this educational activity. Jointly provided by Postgraduate Institute for Medicine and the Society for Immunotherapy of Cancer. This activity is supported, in part, by independent medical education grants from AbbVie Inc., Amgen Inc., AstraZeneca Pharmaceuticals LP, Bristol-Myers Squibb, Celgene Corporation, EMD Serono, Inc. and Pfizer Inc., Genentech, Incyte Corporation, Lilly USA, LLC, Merck & Co., Inc., Novartis Pharmaceuticals Corporation, Pfizer Inc. and Prometheus Laboratories Inc. (as of Aug. 21, 2018). In support of improving patient care, this activity has been planned and implemented by the Postgraduate Institute for Medicine and Society for Immunotherapy of Cancer. Postgraduate Institute for Medicine is jointly accredited by the Accreditation Council for Continuing Medical Education (ACCME), the Accreditation Council for Pharmacy Education (ACPE), and the American Nurses Credentialing Center (ANCC), to provide continuing education for the healthcare team. Postgraduate Institute for Medicine designates this continuing education activity for 1.0 contact hour(s) (0.10 CEUs) of the Accreditation Council for Pharmacy Education. The maximum number of hours awarded for this Continuing Nursing Education activity is 1.0 contact hours. Designated for 0.5 pharmacotherapy contact hours for Advanced Practice Registered Nurses. The PIM planners and managers have nothing to disclose. The Society for Immunotherapy of Cancer planners and managers have nothing to disclose. There are no fees for participating and receiving CME credit for this activity. During the period September 28, 2018 through September 28, 2019 participants must read the learning objectives and faculty disclosures and study the educational activity. After completing the course, click My Credit from the left-hand side of the SITC connectED homepage. Under Pending Credit, click Request Credit for Introduction to Immunology – Second Edition. Ensure that the appropriate Credit Reporting Organization is selected. Click Continue. Complete the post-test and survey. Your Certificate will be available to view in the Submitted Credit section. SITC connectED requires a modern web browser (Internet Explorer 7+, Mozilla Firefox, Apple Safari, Google Chrome) and the ability to listen to audio with the content. Next, to view the course, close this window and you will be taken to the course menu page. Once there, refresh the course menu page and select "View Now" for the last topic. This activity is presented free of charge. The SITC connectED education portal is supported by independent educational grants from AstraZeneca Pharmaceuticals LP and Merck & Co., Inc.